You might be wondering what happened to our annual Game of the Year awards. Don't worry they're coming, we just didn't see the need to rush them. I know it's crazy, but I've always felt that the game of the year should be decided after the year has actually ended. I know that may be a hindrance to getting our name on box art, and maybe it's not even as useful to gamers, but it seems like the only fair way to do it. Deliberately holding off on making a decision allows us to be a bit more thoughtful about which game we think was the best for 2009. Instead of rushing to judgment or doing endless internal votes, we've decided to pick a few finalists among us and then debate their merits. And the best way for you to understand the process, and inevitably our decision, is for us to publish that internal discussion. So that's what we're doing. 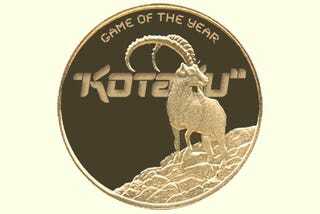 The writers and editors of Kotaku have narrowed down their choices for 2009's best overall game to just three titles. These are the games that one or more of us think was the best game of the year. I've picked one champion for each game and over the course of the week, we will be running their reasoning for picking the game and then the thoughts and replies of the other writers in support of the game or against its selection. After running these three debates we will each mull over the discussions and reach a decision for game of the year. I sincerely hope you take the time to read through each's game's post (we will be posting one a day) and add to the discussion. Explaining why you think the game is or isn't the best of the year.